Unwell Mel ™ is rated 4.5 out of 5 by 33. Rated 5 out of 5 by jlbradley1234 from I love Mel One of my all time favorite match 3 games, used to look forward to the daily challenges before it was boxed into game only format. Great way to zone out and pass the time and some levels are quite challenging. Please Please Please can we get this in iPhone/iPad format!!!!!! Rated 5 out of 5 by sct1968 from great match 3 game I am not one to play match 3's but i've been playing for 3 days now. just can't stop. everything about this game is top notch. Rated 5 out of 5 by lovely62 from Excellent Game This game has brought me many hours of fun, I do hope they come out with a part 2..Keep up the goods work DEV's ..Thx BF as always.. Rated 5 out of 5 by SrRat from Best Match3 game EVER!! I have a lot of match3 games but this is the one I go to when I want to laugh, smile AND be grateful for my ongoing good health. Love poor Mel, the bugs, the treatments, the diagnosies and the cartoons on the calendar. BFG, you guys hit a home run with Unwell Mel. Rated 5 out of 5 by Handsomeme from A Top-5 game in my book! This game is absolutely one of my top games, with a little over 300 levels, it takes days to finish. This of couse means you get value for money, when buying this. The sound and music in this game is really GREAT and don't feel repetitive even after hours of playing. I sure hope that there eventually will be an Unwell Mel 2. I know that if I write that I recommend this here, it will show twice but this game deserve it! Hang in there Mel, I'm coming to cure you! Rated 5 out of 5 by wing117 from A Great Relaxing Match 3! I have tried some top-rated match 3 games but they did not provide the relaxing enjoyment like this one. 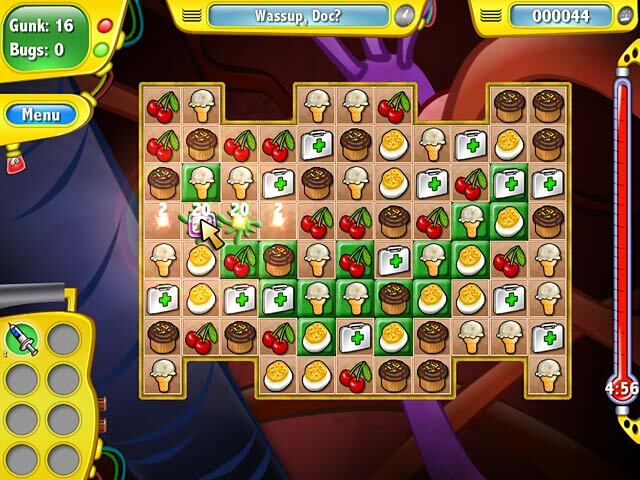 It is humorous, and gives some ingenius and cute stuff to help solve the level. It is not too easy to be devoid of challenge, or too difficult that distresses you. I like HOG too, but I want a game that does not require continuity so I can get back to my work anytime, and more importantly, makes me want to replay even if I have finished all the levels. And this is the one! Even the music lifts my spirit. I really love this game! I strongly recommend it to Match 3 players. Rated 5 out of 5 by Tygrepawz from A hypochondriac's nightmare! 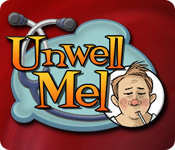 I first started playing Unwell Mel at Big Fish Games, then at Big Sea Games until it closed down. I looked forward to my daily dose of Mel's latest malady & couldn't wait to come back for another round. When the online site closed I had to have it so I bought the game and played it through. It is long, as someone else said, 300 levels and many hours of trying to cure Mel of his ills only to see him relapse when presented his bill for services. It's a true Match 3 game in all the senses and one the whole family can play for hours of fun or just to pass the time if you're a night owl like me. It's one of a few I would keep on my desktop just to play for the fun of it. Rated 5 out of 5 by luv_my_dogs from UnWell Mel Love this addicting game! Will you please make a sequel to this game? Like you did for fairway solitaire. Rated 5 out of 5 by Screwy369 from Funny! The concept is creative. Love the yucky bugs you kill. There are too many special items, especially in the beginning. So for a while, it's mindless clicking without too much strategy to clear the board. But still great, considering how many levels there are, lots and lots! You can tell the developers put effort into this. One of the better match 3 games, in my opinion. Definitely worth checking out. Rated 5 out of 5 by ticaheart from Love this game! Great game. Humorous, fun to play, lots and lots and lots of levels. I play it everyday! This is the best match 3 game I own and that is saying a lot since I have many games. Try it you'll like it! Rated 5 out of 5 by aquarabbit from Classic Match 3 with a Twist My favorite part about Unwell Mel is the obvious thoughtfulness that went into its creation. (Even if the whizzes at BFG took only 3 hours to make it, the game shows lots of care and expertise.) The music and sound effects, the humor, the premise, every detail is relevant and intelligent. Of all the BFG games I've purchased, this is the only one I keep permanently installed on my home computer. Bring on Unwell Mel 2! Rated 4 out of 5 by meme2222 from Mel is one sick dude This game is sooooooo long. I'm on level 163 and I still haven't cured Mel. I don't think he is ever going to be cured because I am so tired of matching the same old tokens now and seeing his sick ole face. This game is great when you start and it does have quite a bit of variety with gunk, bugs, different types of food to match and the salesman selling all kinds of neat stuff to help. These salesman items though are very weak but as you earn money you will get a chance to upgrade to a stronger remedy . Still, they are not that powerful. Also you get in game help of fresh start powder, a mega tab, direction bonuses, coins and candy depending on which type of match you make. So I will highly recommend but after awhile you get tired of Mel being sick with all those cute diseases. Maybe I just want another patient to work on. As far as the challenge, it will have easy and difficult levels and I've had to switch to an untimed game a few times because it can become very tedious when I'm not in the mood for trying to beat the clock especially with the power ups which aren't that strong and it takes awhile to build them up. You are not going to find a lot of levels with big explosions and super clearing of the board. No, they really make you work to heal Mel. You can't switch back and forth with timed and untimed so you will have to create a new profile. But it is worth the buy because you certainly get a super duper long game and the graphics and amusement are good. But after level 163 I want to see another patient or for him to change his diet and eat something different. Rated 4 out of 5 by megwoman25 from Lots to fix on Mel! This game consists of 100 syndromes and 301 boards to play. It took me a very, very, very long time to finish it. It is a good game for new players to match 3 games or people who are very experienced. Most of the time I could beat the levels with the help of the powerups which are really good and even better as you progress. There were only a few levels I had to play again. Every time Mel has a new syndrome, you get to scan his body and different ailments will come up. These are the boards you get to play match 3 on. Once you cure a syndrome completely, the picture of sick mel, starts to look somewhat less gimpy. The goal of this game is to cure mel by doing what I said above. There are bugs to squish, gunk to squash, a salesman to visit. The sound affects are squishy, the power ups are helpful. This game is worth the price. It can be replayed for more best scores. What kept me from giving this game 5 stars was the repetitiveness. Although it is fun to cure mel, he has sooooo many ailments that the boards begin to bore after a couple which is why it took me so long to play this game. There are only so many times you can squish bugs and match tiles. It would have been nice if there was more to the boards like fire or ice or chains like in other games. The bugs each have different "personalities" so that was something unique. For example, some squeeze together and won't let items drop unless you find a third bug and it will go away, some are very easy to pop and make loud noises, some you have to link together that look like starfish (those take forever to pop). In the end I cured Mel and he is well and off on his way. I can see a sequel to this game as Mel seems very accident prone. What I enjoyed most were the names of the syndromes and ailments. A lot of creativity went into this game. And its well worth the money just kind of repetitive and extremely longgggg. Rated 4 out of 5 by AylaAsperger from Quite original, but a little too easy I have been playing this game on the Big Fish Community and then at Big Sea Games, and was looking forward to playing it again. It is still quite fun to pass some time with, but it has been made much too easy, compared to how it was on the community. Every couple of clicks almost your whole board is refilled with items, whereas you needed an upgrade for that before. That said, it's still much more original than most match-3 games. 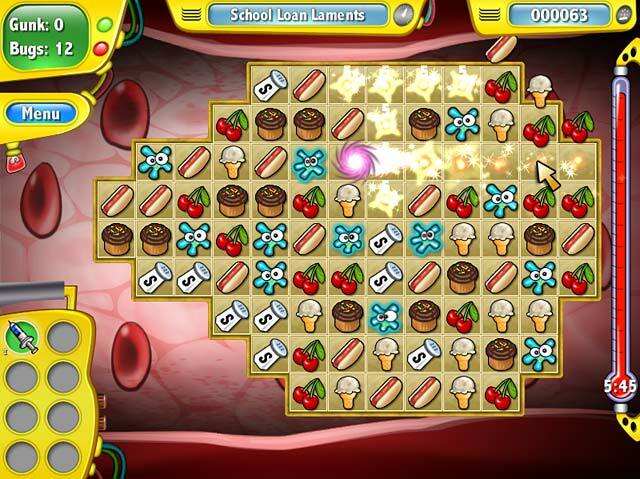 Rated 4 out of 5 by mrm2006 from a very cute game a very cute match 3 game. great for all levels as well as a fun family game. give the free trial a whirl. Rated 4 out of 5 by lukas13 from fun hidden object game. I enjoy playing this game. I find it very relaxing to play. My only problem with it is that you never really finish it. If there is a way to finish it i would love to know it. Rated 4 out of 5 by denniann2 from a long lasting game first, there are 301 levels so you are in for a game that takes awhile. it is a basic M3, with power ups that you buy. it takes a while to accumulate enough money to buy them, but that didn't bother me. poor mel has so many afflictions that you have to cure and they all have silly names. i played relaxed, but there is a timed level. Rated 3 out of 5 by 1boredlady from Mel is okay. I bought this game after reading so many positive reviews. It was fun...at first. Sound fx are fun, wacky illness names are fun.....but it is repetive. REPETITIVE. There are -what seem like- a gazillion levels and the objective is always the same. I've become bored with it and I'm still about 40-50 levels from the end. I won't say I WOULN'T recommend it...but I can't honestly say I WOULD either. Since I must specify one or the other I'm gonna say yes for simplicitys sake. Rated 3 out of 5 by MEnr56 from DON'T BE TOO QUICK TO USE BOARD HELP Personally, I found this game to be extraordinarily and unnecessarily longer than most Match 3 games and am happy that I've completed it; there are just over 300 levels with 100 ailments. I noticed a few things that might be helpful; while there are power-ups that you purchase and upgrade through the salesman, there are also board "helpers" and I suggest that you not be too quick to use them. * the "x" is a horizontal blaster * the vertical arrow blast everything up and down a row * the coins will randomly replace objects and when they dissipate, move the other objects one row down * the Fresh Start I found good to use AFTER I'd done my best to clear as many tiles as possible on my own. 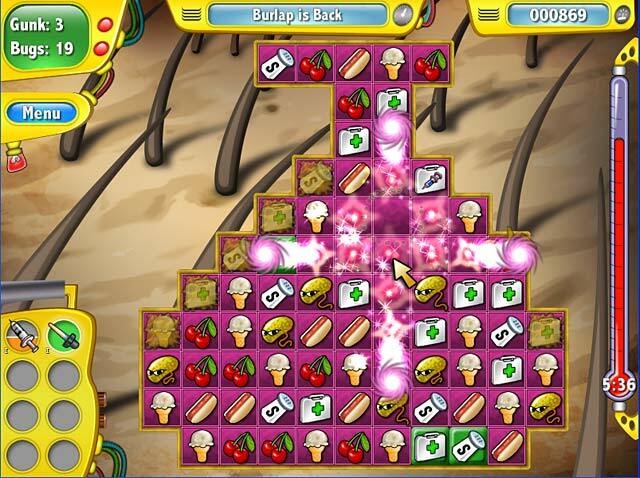 Fresh Start just means that it'll move the objects around; it does NOT mean that you have to restart that level. The GOOD thing about them is that you're able to move them around as you do the other tiles WITHOUT having to use them until you're ready (then click on them) except for the coins, which will disappear on their own in a few seconds but sometimes you're able to make beneficial moves first. The BAD thing about them is that they do NOT break and clear the tile for you; all they do is remove whatever object is on that tile that you still need to clear EXCEPT for the yellow bugs -- they will remove the objects AND clear the tiles if they're close enough to the tiles that need to be cleared. The green bugs are a troublesome sort as they will "expand" until they pop and if you've not cleared them BEFORE popping, they will cause a tile to become a tile that you've got to work on AGAIN to clear. One of the other bit of GOOD NEWS is that when the pink bugs click together (you have to find a 3rd pink bug or use other means to get rid of them) and leave empty spaces around them, you CAN move objects into those empty spaces if you need to in order to continue playing the level, Fortunately, this game has timed and untimed modes of play; I don't think that I'd have been able to complete several levels had I been playing in timed mode. Rated 3 out of 5 by mspaws from 60 minute trial I tried this game, but just could not get into it. For those with a mind that can figure out the game play it will be fun. Poor Mel has every ailment in the book, and you`re the only one who can cure him. The doctor is in, with this madcap Match 3 game!